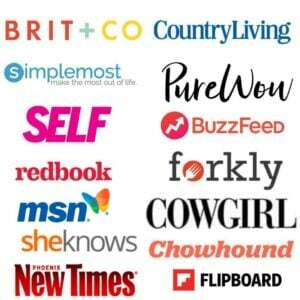 Sponsored Post: This post is sponsored by Pepperidge Farm but the content and opinions expressed here are mine. 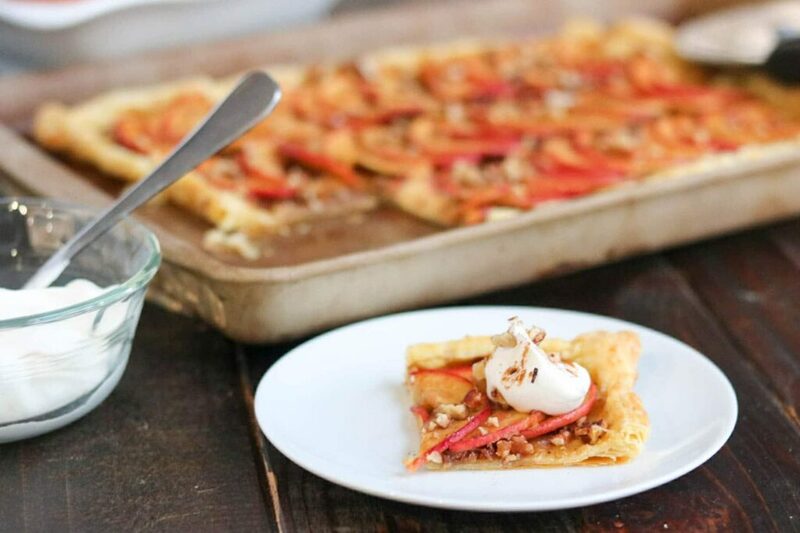 A simple yet impressive dessert simple enough for week nights, but fancy enough for holidays! 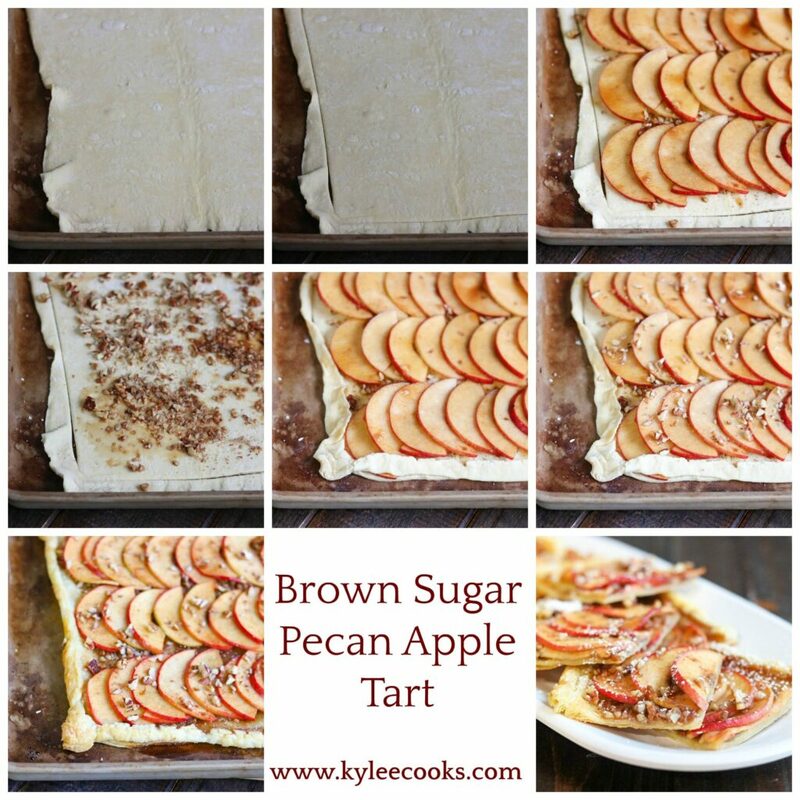 This Brown Sugar Pecan Apple Tart takes just a few minutes to assemble, and 20 mins to bake! 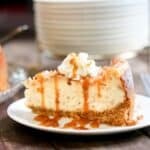 Look how EASY this yummy dessert is – I am SO excited to share this recipe with you all! 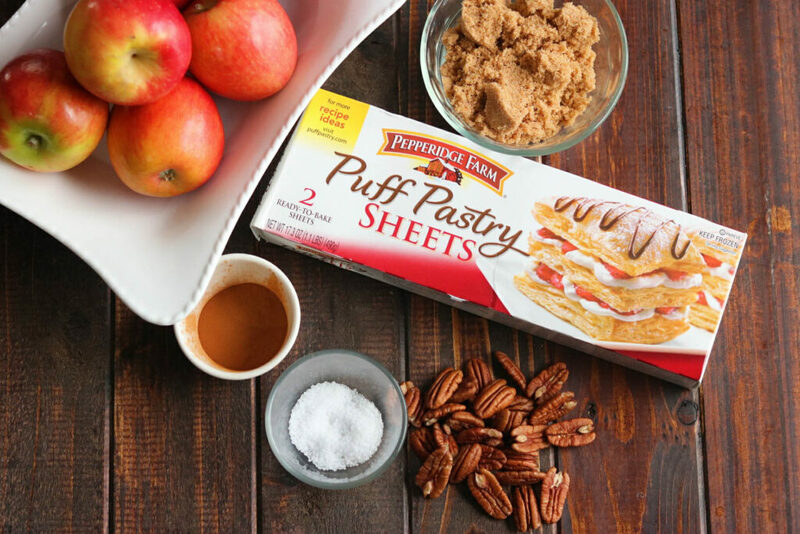 Pepperidge Farm® Puff Pastry on base topped with brown sugar, pecans, apple…. whipped cream – I mean, what’s not to love,right? This entire dessert was born from necessity. 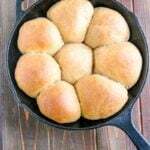 I had unexpected guests arriving for dinner – SOON – so, threw some extra beans in the chili, made a cornbread to make it all go further – but had nothing to serve for dessert! I grabbed some Puff Pastry Sheets, some apples and got right to work. Ta-da!! 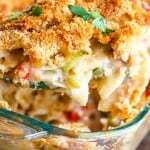 What I love about this is that it is simple ingredients, nothing fancy, and nothing difficult. See? 6 ingredients. BOOM! 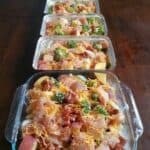 We all loved this – it really is perfect for every day AND major holiday celebrations – no one said things had to be complex to be amazing, right? Holidays can be really stressful, take the complication out, and serve something wow-worthy, with very little work! 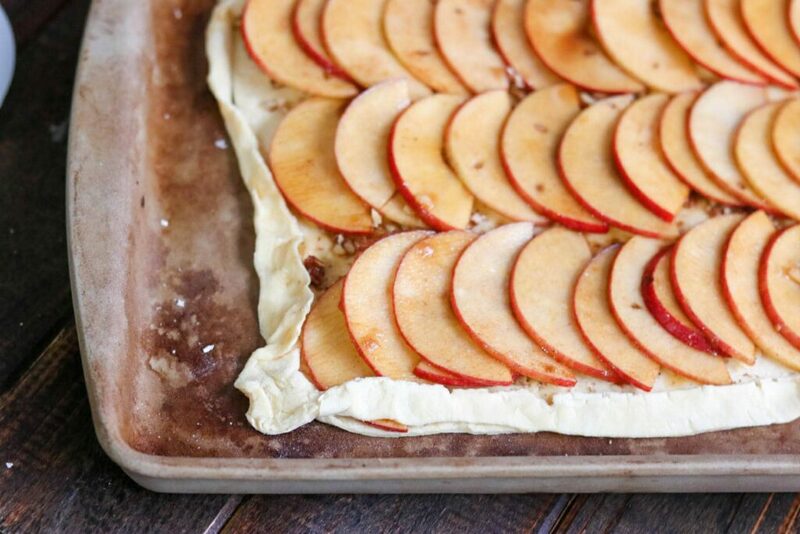 Thaw the Puff Pastry on the counter while you heat the oven, and prep the apples, and we’re in BUSINESS!! Want a variation? Add raisins! Drizzle with a vanilla glaze! 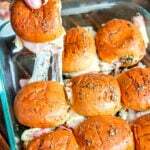 Make miniature versions: cut the Puff Pastry into 6-8 even slices, and top/bake as before. 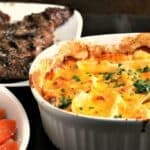 I made this recipe with Puff Pastry – for more ideas/inspiration – check the Pepperidge Farm® website or Pinterest! A simple yet impressive dessert simple enough for week nights, but fancy enough for holidays! 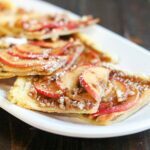 This Brown Sugar Pecan Apple Tart takes just a few minutes to assemble, and around 20 mins to bake! 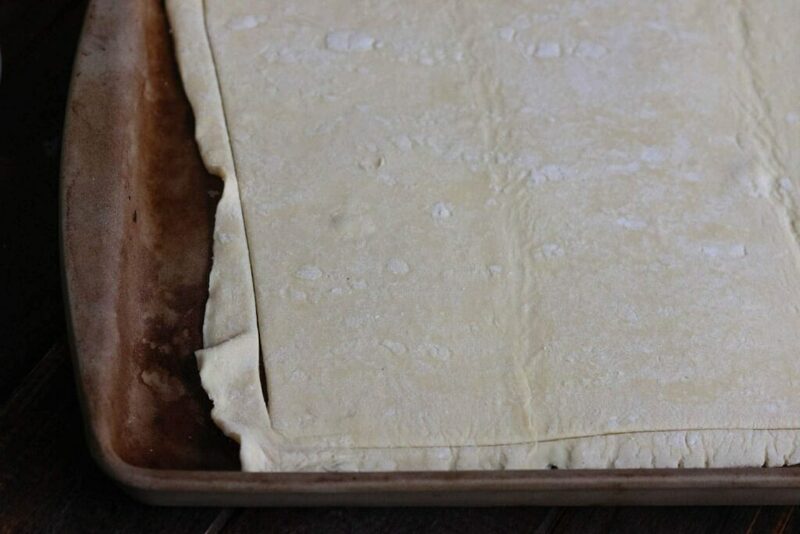 Begin by thawing the Puff Pastry on your counter. It should take about 20 minutes. Core the apples, and cut in half. Cut into slices (they should be fairly thin so they cook all the way through – use a mandolin if you have one). In a large bowl, combine the cinnamon, brown sugar and salt. Add the apple slices and mix well, making sure each slice is covered. Set aside for 5 minutes. Liquid will form in the bowl. Drizzle a little of the liquid from the apples on top, then top with half of the pecans. 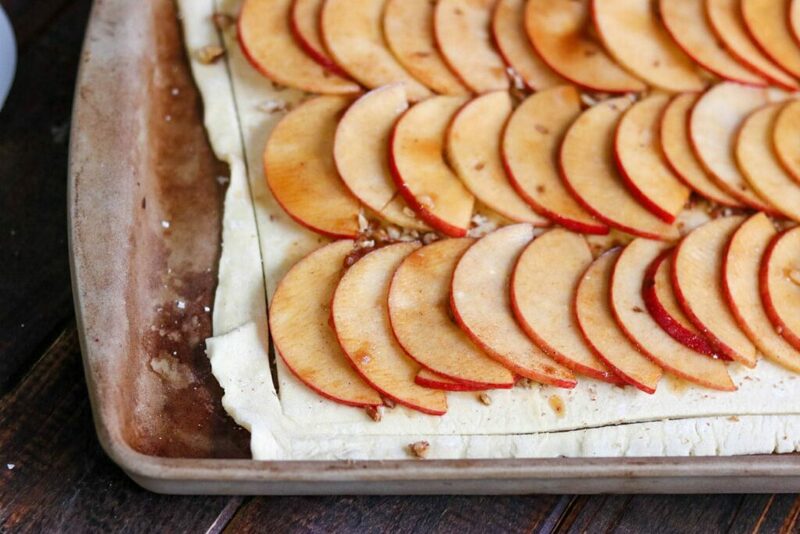 Add the apple slices in even rows, overlapping a little. 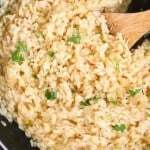 Bake at 425F for 18-22 minutes, or until the edges are a golden brown. 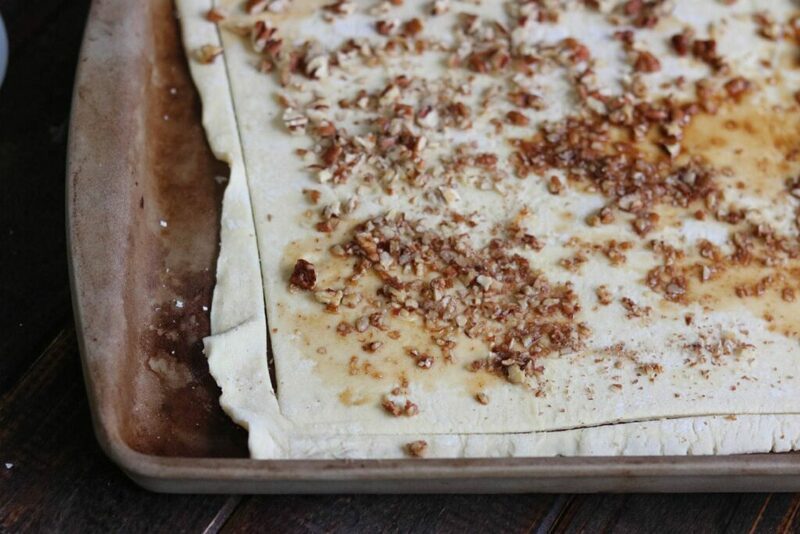 Cut into slices, top with whipped cream and sprinkle with cinnamon and pecans. What an awesome idea. 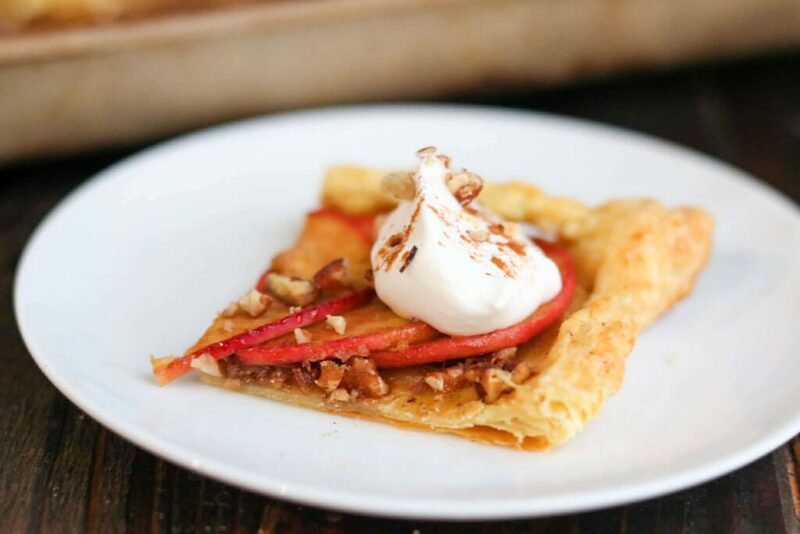 I love using puff pastry, it is so versatile! Plus it makes desserts so much easier. Apples, cinnamon and brown sugar just remind me of holiday cooking and winter and autumn and all those wonderful things. It’s too bad the boyfriend doesn’t like cooked apples…I guess that means more for me! 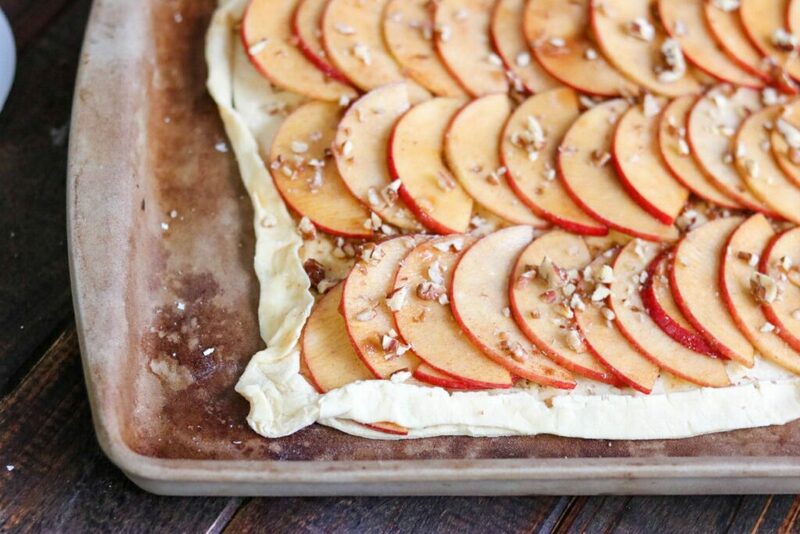 Apple slices make desserts look so pretty. 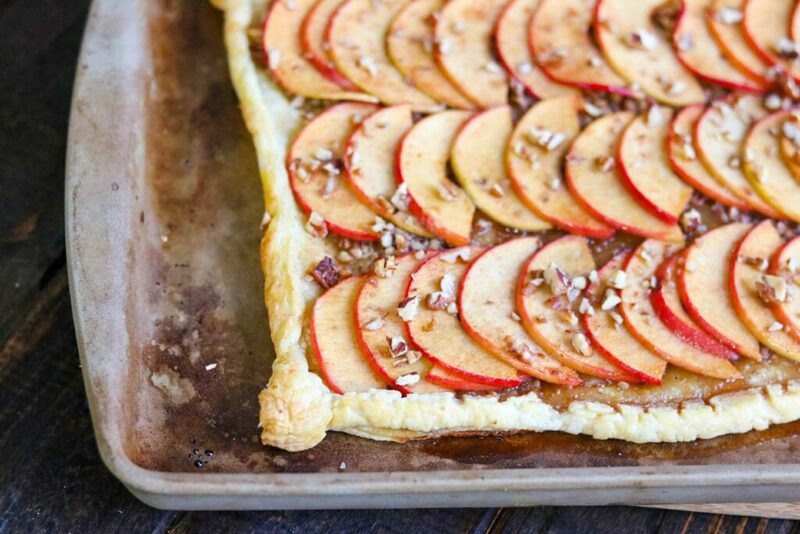 Such a gorgeous looking recipe..apple tarts are my favorite!! Yes!! This has my name written all over it! 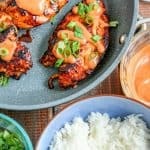 I need to make it asap! 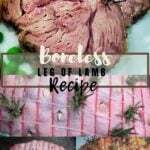 What a lovely and simple recipe! 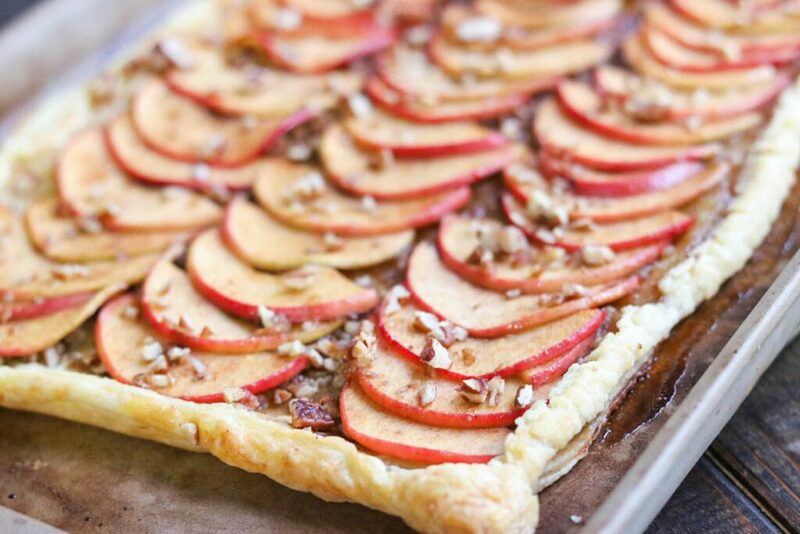 I adore apple tarts and this one looks so delicious with the pecans! What a fantastic “emergency” dessert! 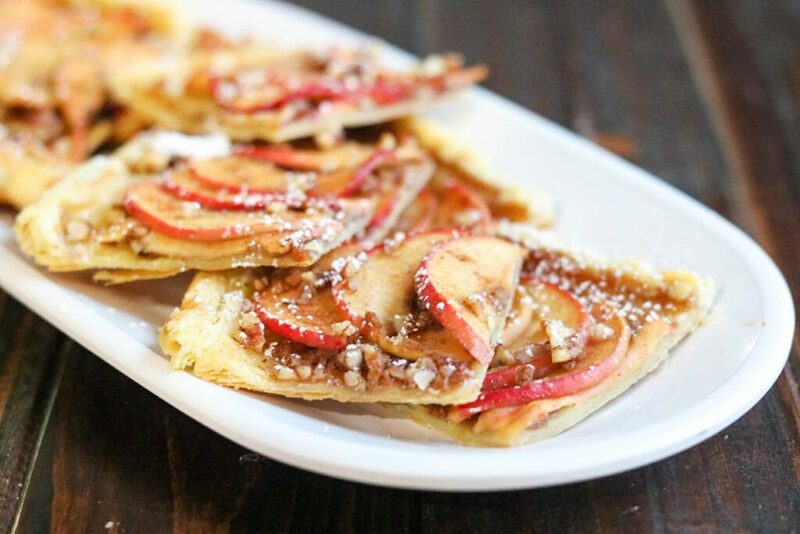 Apple tarts are so lovely and comforting, and the pecans make this one especially tasty!